This awesome curtain measures 34.5" x 79" and will fit standard doorways. Painted all the way around, image shows on both sides, as do all of our painted curtains. Wonderful 90 strand coverage. Totally handmade!!!! 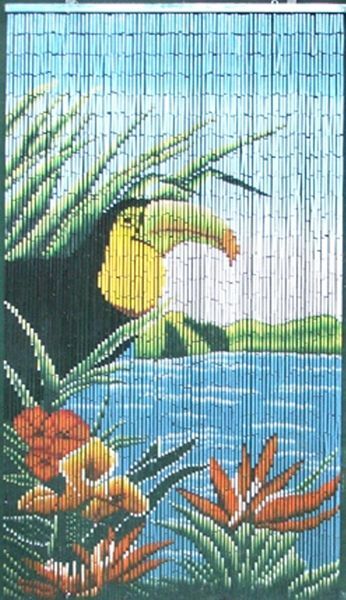 I really like the Tucan Beaded Curtain. It makes me smile everytime I look at it. I use it as a piece of art because it wasn't wide enough to use a closet door covering as I had originally intended it to be used. Toucan Bamboo Curtain was biggest hit in the room this holiday! This probably doesn't seem like a likely Christmas gift, but in Houston, TX where our Christmases are often in the 70's and 80's and everyone is wearing shorts, this is as timely as anything, but in this case, quite unexpected and very well-received. Every eye in the room opened wide when this very well-packed bamboo curtain was removed from it's box. I was able to wrap it as soon as I removed it from the outer, shipping box. I couldn't ask for a more convenient and popular gift. 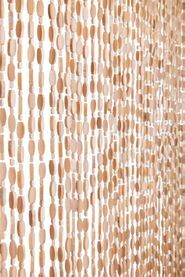 Very colorful and easy to hang :) love it! I love it. One of my friends ordered two of your macaw curtains. As more friends see it, I'm sure you'll receive more orders.